Anybody that knows me, knows that I am a sucker for a good prog album. I love the stories, the long tracks, the instrumental passages, and everything about a well crafted progressive rock album. So it should come as no surprised that when I heard about this album, my interest was immediately piqued. From the first listen I was very pleasantly surprised, this album has got to be in my top twenty progressive rock albums of all time, and the fact that it is a concept album makes it that much greater in my eyes. This is an album that is very deserving of the word “masterpiece”. 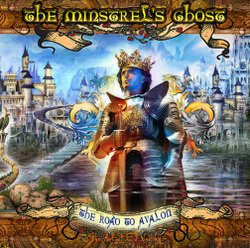 Musically, vocally, and lyrically, “The Road To Avalon” is a prog fans dream come true. The album starts in fine fashion, with a sprawling and beautifully written instrumental intro to the album, throwing out several of the albums music themes within the space of this 7 minute epic kick-off. From the start you can tell that the players on this album are no slouches, and are all amazing at their instruments. Some beautiful guitar parts from the almost unavoidable Colin Tench (not that one would want to avoid his amazing playing), and very cool keyboard bits make this tune one of my favorite album openers ever. Very cool way to being this journey. “Avalon Part 1” is where the story begins, and is one of the most catchy vocal lines that I have ever heard. The hook is one of those that I guarantee you’re going to get stuck in your head for days. It’s so catchy and Blake Carpenter, the projects mastermind, turns in a very impressive vocal performance. Here we are treated to the main musical theme of the album, a part that turns up several times through the album. “Merlin” brings that old familiar wizard into the story, with some piano, guitar, and brilliant soundscapes. This song is so beautifully done. Part ballad, part melodic rocker, with a killer guitar solo, “Merlin” is a great breather after the progressive bombastic opening of the disc. “Lady of the Lake” starts off with a bit of dialogue that helps drive this familiar tale forward. This song is further evidence at how beautiful the music of this band is. With keyboards and a guitar solo leading into the vocal section, and the entire band kicking in with some very melodically pleasing music, and a keyboard solo bit that I just love. “Excalibur” is up next on this platter of brilliance. The vocals sound perfect wrapped up in the music of this track. Once again the keyboards really shine on this tune, and I love a good keyboard performance. The rest of the band really make this song something special, with an amazing instrumental passage that I would put up next to any other musical passage in the genre. The first half of the album, dubbed “The Design”, ends with “Avalon Part 2”, a beautiful close to the first half of the story. Musically this song is much like the rest of the album, a sprawling musical journey. Every musician working beautifully with the others, and a return to the vocal hook from “Avalon Part 1”. The second half of the disc makes up the section called “The Life”, and kicks off with “Camelot”, and we’re welcome to it with a drum solo that will knock your socks off, turned in by Mr. Zoltan Csorsz, of The Flower Kings. He turns in a great performance on the entire album, and it’s cool to hear him take center stage for a minute, before the entire band turn in a blistering performance on this song. The guitar just kills on this tune, and once again Blake gives a beautiful vocal performance. This is a great song, my favorite lyrics on the album, and one of my favorites of the entire genre. “A Love Betrayed” kicks off with more dialogue to help tell one of the best stories ever written, before moving into a kill guitar solo to open this track. Some atmospheric keyboards help drive this song forward, with some great bass work from Troy James Martin, and another amazingly catchy vocal performance that is sure to get stuck in your head. “The Son” is without a doubt the biggest rocker on the album. A blistering guitar part, a pounding rhythm section, and some rocking organ, this is a great song. Once again, the vocals work perfectly with this very cool song. Everything about this song really rocks. A great addition and a cool way to mix things up. The next three songs close this album in amazing fashion, an impressive one-two-three punch here, with “Avalon Part 3” reprising the musical theme of the album, bringing back the very catchy vocal hook from the start of the album once again, even giving way to a very cool keyboard solo. I just love Blake’s work on the vocal section here. Very cool stuff. “Le Morte d’Arthur” is another chance to bring back the theme, but with acoustic guitar and a more laid back approach this time around. Some very beautiful vocals and keyboards from Marco Chiappini, as well as yet another guitar solo dripping with emotion. A very beautiful piece. And finally, we end with the appropriately titled “The End”, an amazing recap of some of the musical themes of the album, with some final vocal bits from Blake. A great way to close out this incredible album, and one that still gives me goosebumps to this day. A truly amazing album is hard to find these days, as many artists say that the album format is going out of style, but “The Road To Avalon” shows that this so called lost art-form is alive and well in the progressive rock community. This album is an essential in any prog fans collection, and must be heard to be believed.